IHH - a Turkish humanitarian relief fund with a radical Islamic anti-Western orientation. 4. The report deals with the charities and their involvement in terrorism during the conflict in Bosnia, where aiding Muslims in distress was an Islamic religious duty. Islamic activists dominate the leadership of the largest charities, and prominent members of some smaller organizations have been identified as extremists. The main objectives of the organizations include proselytizing, helping the needy and defending Muslim communities. Where Muslims are engaged in armed conflict, some Islamic organizations provide military aid as part of a "humanitarian" package. 7. 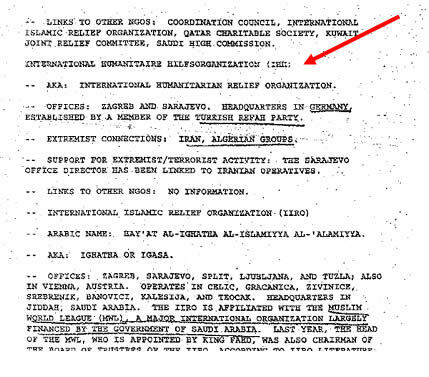 Some the charities mentioned in the report were designated by the United States as terrorist organizations after the 1998 embassy bombings in Africa, while the majority were designated only after 9/11.